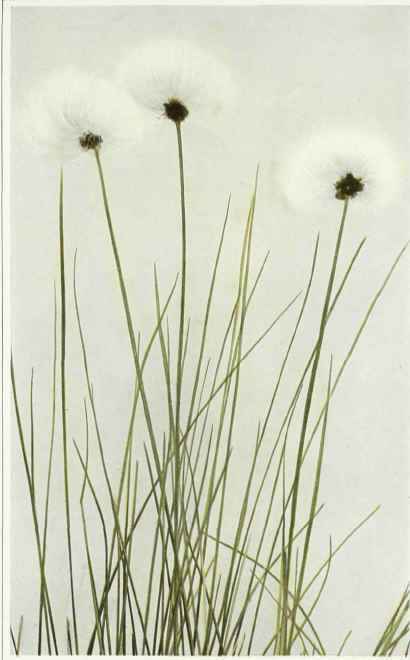 The Cotton Grass may be regarded not so much as a wild flower as one of the most ornamental of the sedges, since it is not a true grass. It is an inhabitant of cold, mossy bogs. The stiff culms, forming tussocks, rise eight to twenty inches above the surface of the bog and each culm bears at the summit a solitary spikelet of small, perfect flowers; each flower with six scalelike divisions, three stamens and a three-cleft style. Within the scalelike perianth are numerous soft, white bristles, which become greatly elongated in fruit, at which time the bog where the plant is growing becomes beautiful with hundreds or thousands of these waving white plumes. Common in sphagnum bogs from Newfoundland to Alaska, south to Massachusetts, Pennsylvania and Wisconsin. Flowering in early spring, the white plumes being at their best in June or, in the far north, in July. The Sheathed Cotton Grass is but one of a number of related species which add much to the beauty of our wet meadows, swamps and bogs in summer. Perhaps even more abundant in the north is the Thin-leaved Cotton Grass (Eriophorumviridicarinatum (Engelmann) Fernald) with five to thirty nodding white plumes, and the Virginia Cotton Grass (Eriophorum virginicum Linnaeus), in which the soft bristles of the mature plume are of a dingy brown color.